Choices in reproductive technology have multiplied at a staggering rate. Is our society prepared to decide on issues about procreation (artificial insemination and invitro fertilization) or genetic engineering ("designer children" and selective abortion)? How can we protect children--both born and unborn--who are conceived in these ways from being regarded as merchandise in the expanding marketplace of genetic services? Ted Peters sets out the challenges of these new technologies with clarity and precision. He looks anew at Christian theology and proposes an ethic "for the love of children." 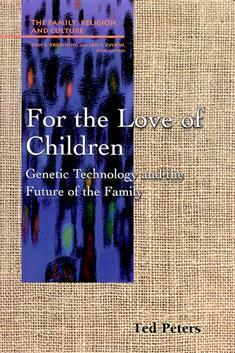 Peters contends that only by affirming all children and their claims upon parents will society deal constructively and ethically with the many reproductive choices available now and in the future. The Family, Culture, and Religion series offers informed and responsible analyses of the state of the American family from a religious perspective and provides practical assistance for the family's revitalization.